In 2001, the Solidor 5 replaced number for the number Solidor 3 on behalf of Emeraude Lines. As Solidor 3, she is part of the series of JumboCat 60 Fjellstrand Finnish manufacturer. Compared to Solidor 3, she is equiped in addition to a night vision system to enable it travels at night, and a stabilization system even more sophisticated. She can provide connections Saint Malo to Jersey in 1:15 and Saint Malo to Guernsey in 1:50. In February 2002, Emeraude Lines gave a new livery at Solidor 5 to celebrate the bicentennaire of the birth of Victor Hugo. In late 2003, the Solidor 5 was taken out of service after the resumption of Emeraude Lines by Sogestran. Having spent several months in the port of Cherbourg, she was detained for engine problems and remained docked in the basin Jacques Cartier in Saint-Malo. 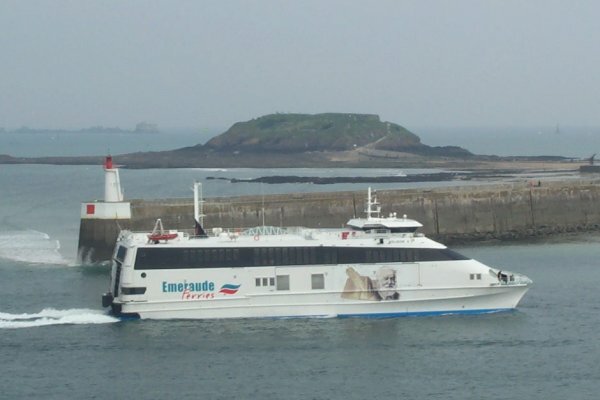 She took over the service in spring 2005 after repair, and rejoined the flagship of Emeraude Ferries ... In late 2005, after setting a new repair,she has been leased by Sogestran for service in Bay of Naples under the name Don Francesco. This is the last ship Emeraude Ferries.